This book had a lot of action and it kept my attention from the time I picked it up, till I finished it, it also kept me guessing as there were a lot of possible suspects. I look forward to more in the Living History Museum Mystery Series. Get swept away back to the civil war era with this historical whodunit that will have you so involved with the story you will find it hard to put down. This is the first book I’ve read by Amanda. I really enjoy her writing style. The story has an easy flow that carries the reader along. There are plenty of suspects, drama, history, colorful characters and personal family issues and even romance. The story is fast paced mostly taken place in one week time….I would love to read more mysteries set at the Living History Museum. Can’t wait to see what happens next at Barton Farms. 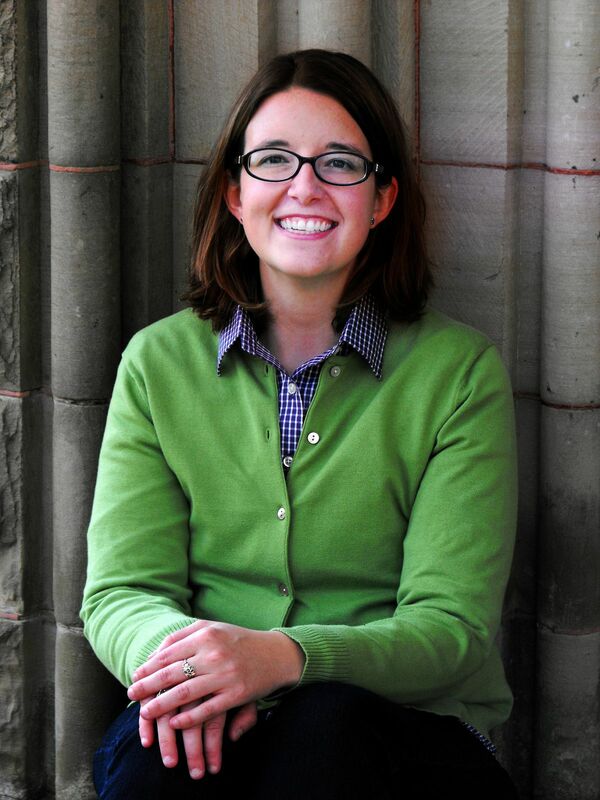 Kelsey is a likable and strong heroine and sleuth. Cynthia, Portia, Ashland, and the other characters add to the story with a bit of humor. 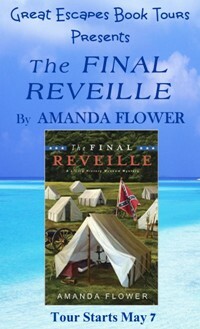 Amanda Flower does a nice job of bringing to the reader the feel of the encampment and the challenge of remaining in character. It ‘s written very well, captures the reader from the first pages: the plot is compelling, the characters are well developed, humorous and fun, the pace is fast. The descriptions are so detailed that it seems to really make a tour through the streets of this old village. The writing was great at setting the scene and making Kelsey’s love of history contagious. I enjoyed getting to know all the characters, and there are quite a few! I have to say that I was not sad that Maxwell was murdered, he was not nice or up to any good. Definitely a series to watch and we give it 4 paws up. 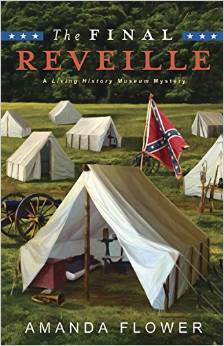 As a lover of history and of mysteries, I found The Final Reveille to be very satisfying. I enjoyed the main character Kelsey Cambridge. The setting, plot and characters were all well defined. As the director of Barton Farm, a living history museum in Ohio, Kelsey Cambridge is underpaid and underappreciated, but she loves every minute of it. Determined to keep the struggling farm open, she plans to impress the museum’s wealthy benefactress, Cynthia Cherry, with a Civil War reenactment on the farm’s grounds. Unfortunately, the first shot in the battle isn’t from a period soldier. It’s from Cynthia’s greedy nephew, Maxwell, who fires a threat at Kelsey to cut the museum’s funding. The next morning, things go from bad to worse when Kelsey discovers Maxwell dead. Now Kelsey is the police’s number one suspect, and she must start her own investigation to save Barton Farm . . . and herself. I like the setting of a living history museum—we have one not too far from me and I find it a really interesting place to visit. 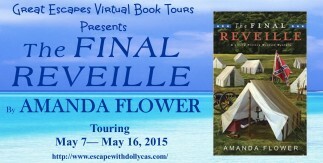 Thanks for featuring Amanda Flower and her new release, The Final Reveille! I’m looking forward to reading it!